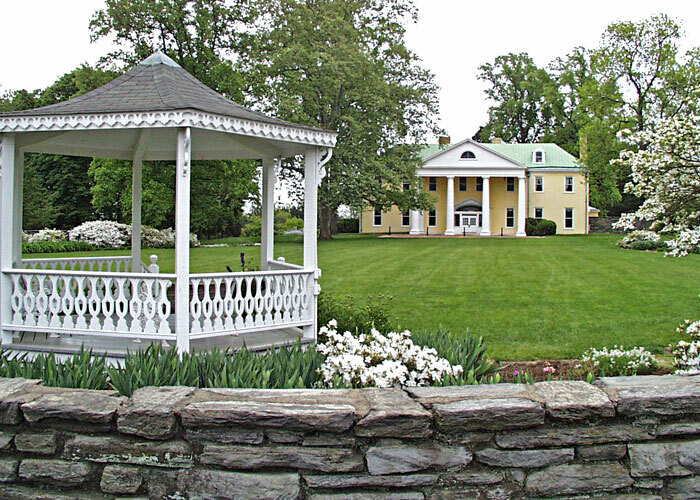 William du Pont, Sr., a member of Delaware’s prominent industrial family, purchased the Robinson estate in 1893. Over the next 3 decades, he expanded the property by buying up adjoining farms and established a facility for raising and training draft and carriage horses for show. William du Pont, Jr., known as “Willie”, continued this emphasis on the raising and training of horses when he inherited the estate in 1928, although he was more interested in racing and dressage. He was also and avid tennis player, and his second wife, Margaret Osbourne du Pont, was a national tennis champion. As a result, he added both indoor and outdoor tennis facilities to the estate. His greatest change, however, was to alter the Robinson’s Gothic castle to a reproduction of Montpelier, formerly the Virginia home of President James Madison, where du Pont had lived as a child. Today, many of the activities which were introduced by “Willie” du Pont are enjoyed by visitors to Bellevue State Park, which was acquired by the state in 1976. His home has been preserved, originally as a restaurant but now can be rented for weddings or banquets. Tennis continues to be an important activity. There is also an equestrian program, which includes an innovative program for handicapped people.